Last week I was in Singapore to attend Singapore Airshow 2014. Ever since I had my first taste of an air show in Farnborough, England back in summer of 2012, I have been looking forward to attend another one. 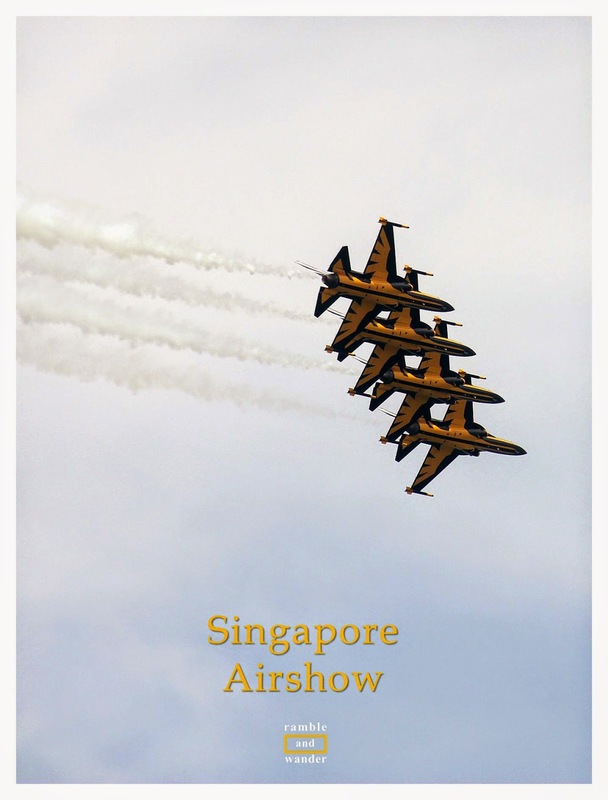 Touted as one of the biggest and best air shows in Asia, Singapore Airshow 2014 seemed to be the perfect choice. Excited, I went down south to the island republic by an overnight train from Kuala Lumpur, looking forward to mainly watch the aerobatic flying display shows. They have 2 shows a day during the public days. Due to unforeseen circumstances, I arrived late at the Singapore Expo Hall 7 where the ticket and security checks were done for visitors taking the shuttle bus to Changi Exhibition Centre, the air show site. The queue was almost non-existent at the time and the arrangement for the shuttle bus worked seamlessly. So kudos for that. Unfortunately, I was still late and didn’t get to the air show site until around noon which means that the first aerobatic flying display show, the morning show, was already over. I met with Fariz of Out of the Box, Up and About briefly before checking out the static display under the scorching hot sun while Fariz, with his head covered in red and white keffiyeh, went inside to the exhibition hall for the trade booths. 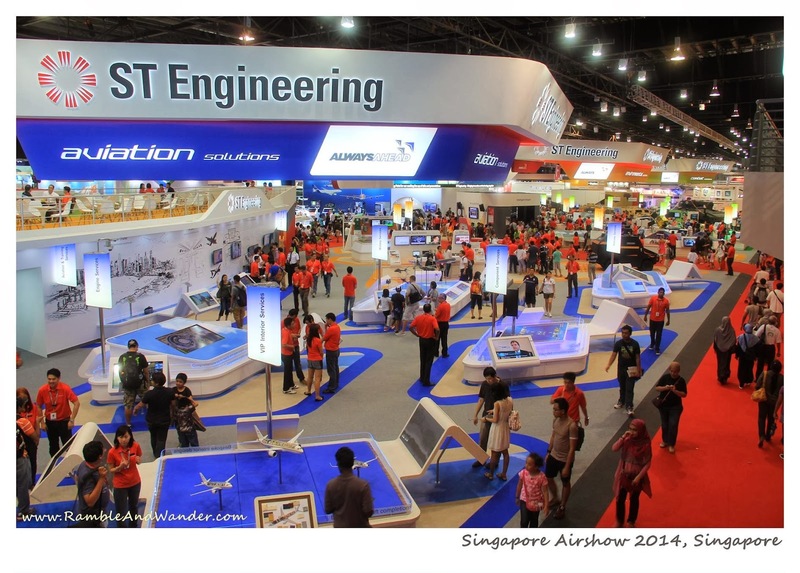 Having been to Farnborough Air Show in 2012, I couldn’t help but start comparing it with Singapore Airshow 2014. There were not as many aircrafts for the static display at the Singapore show and the few that they had were mostly of military types and private/ business jets. There was no commercial passenger jet at all. The star attractions, Qatar Airways’ Dreamliner B787 and the brand new Airbus A350 were there but only on trade days, not during public days, so the general public missed out on them. The main highlight of the static display on the day was US Air Force’s C17. I didn’t see any flying display team at the static display area. Despite this, there were plenty of interactive activities for visitors especially those that involved Singapore Air Force's aircrafts. After a quick and simple brunch (we wanted to buy a pizza but there was a 40-minute wait for it, that is after queuing for the counter and upon placing an order!) we moved to the area facing a river where they would do the aerobatic flying display. Unlike at the Farnborough, they don’t have an airstrip at Changi Exhibition Centre itself so we didn't get to see all the taking offs and landings. 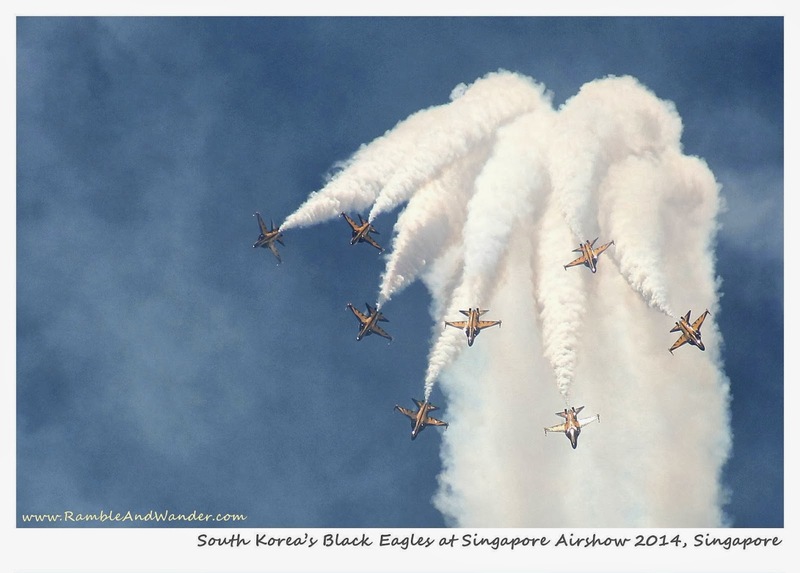 And then, it was the turn of South Korea’s Black Eagles team. Fariz left soon after while I moved into the exhibition halls to check out some of the booths. There were quite a few booths in the halls, a lot more than what was offered to the general public at Farnborough in 2012. A few of the booths offered freebies like tags, pins and bags but most asked you to show proof that you have liked their Facebook page, which is nice if you have roaming data package, that is. They did have a Wi Fi area but it covered just a small area towards the back of the Exhibition Halls, far away from most booths that offered freebies. Overall, it was a good day out at Singapore Airshow although how I wished the aerobatic flying display shows were longer and involved a lot more teams. I bought the ticket (SGD22 + SGD3 SISTIC booking fee) at one of SISTIC’s agents in Kuala Lumpur, Holiday Tours & Travel Sdn. Bhd. Tickets however could be bought online and picked up at any of SISTIC’s agents whether in your locality (if they have one) or in Singapore itself. There was no ticket on sale at either Singapore Expo Hall 7 or Changi Exhibition Centre. Going to Singapore? Do check out these Singapore hotels for your accommodation requirements there. For other blog entries on Aviation, click here. For other www.RambleAndWander.com blog entries on Singapore, click here. Dia ada buat satu lagi lambang - heart and arrow - tapi tak berapa clear sebab background ada awan. Tapi nice kan? Ha! I know you were there during the trade days, i.e. on weekdays. I saw the photos on FB, haha! I however went there during the weekend when it was opened to the public. Unfortunately the A350 has left already by then. I think you were in Sarawak already too that weekend. You did?? So what happened? Did you end up going at all? I thought you're going there for work? holy cow!!! this is soooo cooool!! dang! upon checking their website, the event has ended...gosh...and i have to wait for another 2 years..
Hi Fahmi! Yes, if you're into aircraft, do try to go to the airshow. Singapore Airshow however is held only once every 2 years so the next one is going to be held in 2016, not next year. Wooooah..yang Black Eagle itu keren!